Summer? It's only April! Why in the world am I already talking about summer? ...because the temperatures are in the upper 80s/low 90s around here. And because I stuck my feet in the pool this weekend and the water felt really good, not freezing cold. The pollen has already come and gone. The humidity has rolled in. 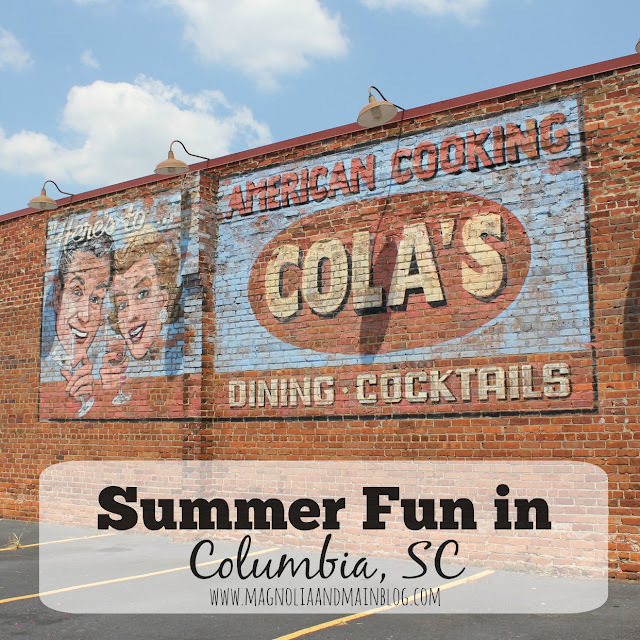 Ready or not, Columbia, summertime is here. It's time to get out and enjoy it! 1. Go to a Fireflies baseball game. Y'all all know my love of the Fireflies. Just go ahead and go see them already, k? 2. Hang out on Lake Murray. Lake Murray is THE place to be on a gorgeous weekend in the summer! No trip out on the lake is complete either without some boiled peanuts. My favorite? The Dam Boiled Peanuts that you can find at the gas station on the Irmo side of the dam. This has been on my list of things to do every single summer. Have I done it yet? Nope. But I hear fantastic things about it from the people who have done it! 6. Explore the local brewery scene. You can visit each brewery one by one on your own... or you can hop on the Columbia Brew Bus, see several breweries in one afternoon, and have a special tour/tasting at each brewery. 7. Wander through Soda City Market on a Saturday morning. Because everyone loves local vendors, delicious food trucks, an excuse to be outside, and truly excellent people watching. Apparently, it gets hot in Columbia in the summer. What better way to cool off than to visit some of our award winning museums like the State Museum and the Columbia Museum of Art? Columbia friends: what else should I have on my list of things to do in Columbia this summer?? So many fun things! Lucky for you guys the pollen is gone - my car was covered in a thin layer of it yesterday! I'm not from Columbia but I lived there for a few years and am now just an hour down I20 but all of these are good suggestions! And for real, Columbia is THE hottest place on the planet during the summer! It's unreal! Ha! The zoo, baseball, and floating on the river - so fun! I feel like all the rivers down here are black water (which I don't plan on going in lol), so I'd love to try that up by you! All of these ideas sound like so much fun!! I've heard great things about the market! Love this list... you may have just inspired a blog post from me tomorrow! Well now this has me craving a trip down south! you seriously have so much fun stuff. i hope you get to go out on the river, and that market looks super fun. one day i'll come that way, and charleston too. one day! I am so jealous of that weather! It is currently 45 degrees in Michigan :( WAHHH! Oh Hey, Low Tide Brewing! The Fireflies are Coming to Town!